In the niipinwi 2013 edition of aatotankiki myaamiaki – the Miami Tribe of Oklahoma’s newspaper, I recently wrote a brief summary of Helen Frost’s SALT: A Story of Friendship in a Time of War. This book was partly a product of a collaborative effort that included Myaamia people living in the Fort Wayne area, the Fort Wayne Historical Society, and the staff of the Myaamia Center. This post is an attempt to provide some additional historical background for the book. The war in the title of the book is the War of 1812, which was a disastrous conflict for our people. I’ve referred to this conflict extensively in historical presentations during the Miami Tribe’s National Gathering in 2012 and 2013. But this chaotic time remains difficult for our community to talk about with our youth. Through the experiences and perspectives of Anikwa (a Myaamia boy) and James (an American boy) SALT provides our youth with a narrative that respects the complexities of the times and at the same time can facilitate new levels of understanding and questioning. The staff of the Myaamia Center was focused on facilitating the creation of a book that met the educational needs of our people, but it’s my belief that Helen and her editors have produced a book that can facilitate new levels of understanding and questioning for anyone of any age. SALT is a book that I will read to my children and will continue to recommend to other Myaamia families. Thus far, I have heard nothing but positive responses from readers within our community. We are a small but diverse community, and there will be those of us who don’t like the book. It is my hope, that the conversations generated by these various perspectives can benefit our community as we watch the numerous commemorations and celebrations taking place around the 200th anniversary of a war that certainly gave us no reason to celebrate. In a similar vein, I hope that non-Myaamia readers leave this book asking good questions about the past of this country that we all share today. Perhaps they will view the next War of 1812 commemoration from a new perspective and begin to ask the hard questions that can lead to changes in present day behaviors. In my experience, SALT represents both the value and the challenge of writing in poetic verse. If you want to read an example Helen’s writing style, click here and look at pages 2-4 and 15. Verse sacrifices descriptive textual depth in exchange for the razors edge of human experience. I have deep respect for this style of narrative, for it is a similar style that informs our aalhsoohkaana (winter stories). It is this intense focus on human experience that allows our winter stories to continue to move with us even as the facts of our contemporary context constantly shift. As an historian, I recognize that the verse style cannot effectively carry the detail I expect in an historical monograph, but these kinds of narratives serve different purposes than historical works. Good fiction, like SALT, allows readers to wrestle with emotion, perspective, the known, and the unknown in ways that are different from historical texts. Used knowledgeably, these two styles can complement each other in useful ways. Like all good works of fiction, SALT has produced some interesting conversations both inside and outside our community. 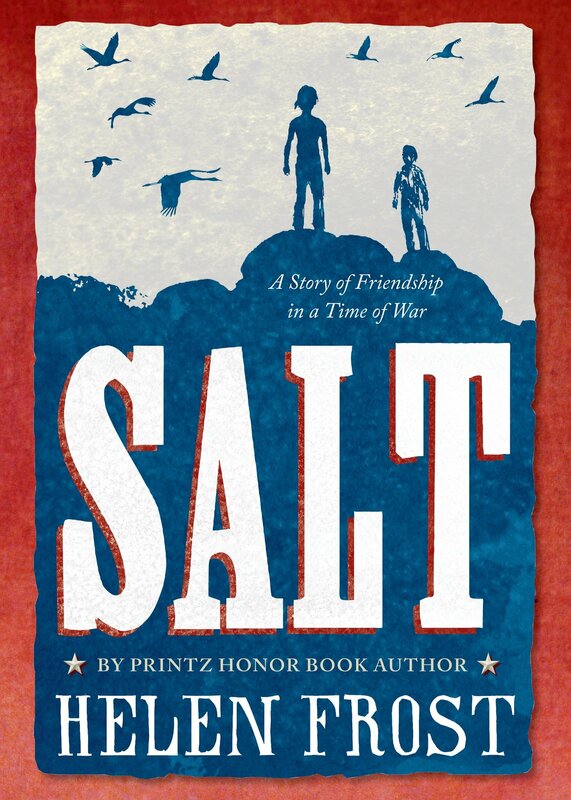 Some readers, especially parents and teachers, want to know more specifics about the history that informs SALT and below I have attempted to address the key questions that have arisen. Some of my responses reveal key plot points in SALT. So if you want to, save this post until after you’ve read the book. In addition, I want to share my own historical interpretations here without violating our community’s tradition of respect for an individual’s right to interpret stories as he or she sees fit. We shy away from anything approaching an absolute interpretation out of respect for each other’s perspectives and in order to show respect for the story itself. I expect that there will be disagreement with my interpretations and I hope you will want to talk about these differences of opinion. We as a community have much to learn from each other. Hopefully, Helen will attend our Family Day at National Gathering 2014 and we can all gather to discuss the book and our interpretations together. Question: What was the War of 1812 like from a Myaamia point of view? SALT is set in a period of time that approximates the situation that existed in the summer and autumn of 1812. If you want to read a more detailed background of the war, see my post “A Story of a Chicago Fort.” The War of 1812 is a difficult conflict to summarize concisely. It is fair to say, though, that it was a war we did not want and one that we tried to prevent. I often use the word “šaakwiteehiaanki” – our hearts were crushed and burned/ we were mournful – to describe the impact of the war on our people. šaakwiteeheeci noohkimina wiihsikaaninki – She mourns at Captain Flour’s grave house. Noohkimina survived the War of 1812, but this scene depicts the mournful feeling of Myaamia people after the war. Image courtesy of Tippecanoe County Historical Association. From a Myaamia perspective, the war in the lower Great Lakes was the result of conflicts over how, or even if, the United States would expand into the lands that eventually became the states of Indiana, Illinois, Michigan, and Wisconsin. Tribal communities splintered over the question of how they would respond to increased American settlement. The Myaamia were among a handful of tribal groups that sought to create a new way of life through negotiated land cessions with the United States. Numerous other groups formed in opposition to that strategy. Most famous among these was the community at Prophetstown led by Tenskwatawa and Tecumseh. They argued against any cession of land and proposed a new inter-tribal means of revitalizing native lifeways in the lower Great Lakes. Tensions increased among all the groups of the lower Great Lakes as the international conflicts of the Napoleonic Wars (1803-1815) drew the United States into declaring war on Great Britain. For those opposed to U.S. expansion, the War of 1812 presented an opportunity to halt this expansion at the Wabash River or potentially push the expansion back to the Ohio River. These groups believed that by allying militarily with Great Britain, they could force American settlements to retreat and secure a shared landbase for native people. For communities, like ours, who had decided to live in peace with their American neighbors, war created very little opportunity coupled with a lot of risk. Our leaders had been terribly betrayed by British leadership on two earlier occasions and did not believe we could trust the British. In addition, our leaders knew that because our villages were so close to American settlements, our homes would be quickly and easily put to the torch by American armies. Tragically, both of our leaders’ assumptions were correct. If you would like to learn more about the War of 1812 in general, I recommend the Civil War of 1812 by Alan Taylor. Taylor’s book does not address Myaamia history at all, but he does an excellent job of highlighting the divisive and chaotic nature of the War of 1812. If you would like to learn more about Tenskwatawa and Tecumseh, I recommend Tecumseh: A Life by John Sugden and this video of a presentation by Greg Dowd about the myths Euro-Americans created about Tecumseh . There are a lot of references to Myaamia communities in Sugden’s work and he does a fairly good job of showing how early on the war divided Myaamia communities on the middle Wabash from Myaamia communities in the Kiihkayonki area. Below is a timeline of key events for the Myaamia in the War of 1812. Question: What was the area around Kiihkayonki like prior to the War of 1812? 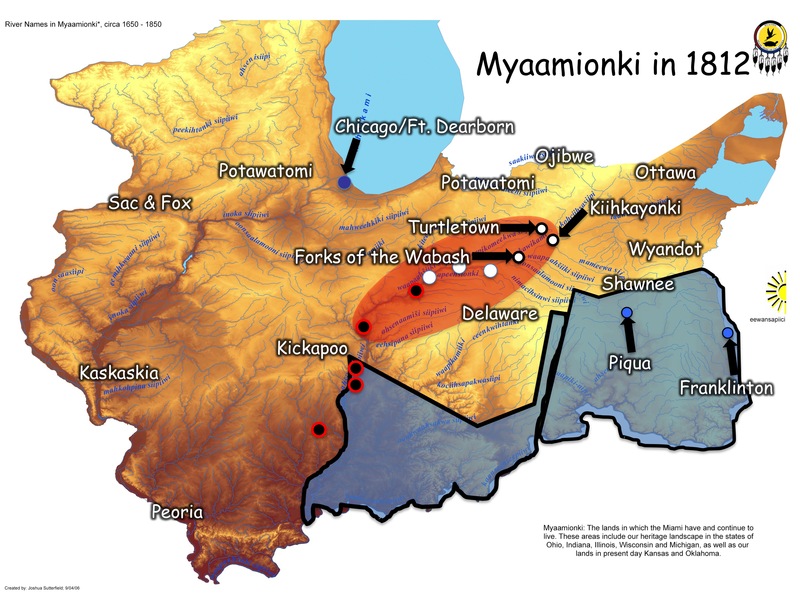 The setting of SALT is the Myaamia community around a place we still call Kiihkayonki (Kekionga – Fort Wayne, IN). Kiihkayonki has been a Myaamia place for as long as we can remember as a people. Over hundreds of years, we have shared this place with multiple groups, and beginning in the 1780s it became the center of an effort to resist the encroachment of the United States. Outsiders often refer to this alliance as the “Northwest Confederacy.” Current research indicates that as the Shawnee and Delaware moved to Kiihkayonki area, they built their own villages separate from the two Myaamia Towns near the confluence of the Maumee. Following the defeat of the U.S. Army at the Battle of the Wabash, also known as St. Clair’s Defeat, the center of the intertribal effort moved to the confluence of the Maumee and Auglaize Rivers and again the various peoples constructed separate towns all along the valleys of these two rivers. This habit reflects the reality that during this period of time, the Myaamia were a village-centered people and not a singular nation or confederacy. In fact, much of what we take for granted today as a “Miami Tribe” developed out of the ashes of the War of 1812. Most of our community knows about the Kiihkayonki of the 1780s and early 1790s, but the area changed in significant ways following the Treaty of Greenville in 1795. The Myaamia villages in white along the northern Wabash tried to maintain peace early the war. Myaamia villages in black set the largest numbers of men to support attacks on American forts and settlements. The blue shaded area on the right marks territory ceded in 1795 and the area on the left territory ceded from 1803-1809. After the construction of Fort Wayne and the signing of the Treaty of Greenville the bulk of Myaamia people moved to the villages at Turtletown (west of Kiihkayonki) and the Forks of the Wabash (south and west of Kiihkayonki). Smaller groups of Myaamia people remained at Kiihkayonki, but this village lost its prominence among the other villages. Many meetings and treaty payments drew a multitude of different tribes to visit Ft. Wayne, but the only non-Myaamia village in the area was a Potawatomi village to the north on the Kociihsasiipi (St. Joseph River). Question: How did Myaamia communities make decisions prior to the War of 1812? Anikwa’s experience in this story reflects our understanding that in the early 1800s an individual would have lived his or her daily life through the lens of family and village. Each Myaamia village had male and female civil leaders and male and female war leaders. The civil leaders together with the heads of families formed two separate councils – a men’s council and a women’s council – for discussing important decisions that affected the whole village. Children, like Anikwa and his older cousins, were not a part of these councils. Participation was reserved for the established heads of families. Decisions were usually made with consensus and required a lot of time and negotiation. Following a decision, male civil leaders served as the ambassadors of the village and were responsible for carrying messages to the villages of other groups and greeting distinguished visitors to their village. Female civil leaders were responsible for the production of the gifts carried by an ambassador and for the care of important visitors. Myaamia villages often came together in larger councils to negotiate peace as well as make war, but village independence was always respected. As a result, villages often disagreed and chose different paths. The different choices made by Myaamia villages during the chaos of the War of 1812 highlight this reality. In the fall of 1812, Waayaahtanwa (Wea) and Peeyankihšia (Piankashaw) villages on the southern Wabash chose to fight against the United States and Kiihkayonki area villages, like Turtletown and the Forks of the Wabash, tried to cling to a neutral path. Question: Was the period between 1795 and the 1812 really peaceful? The Treaty of Greenville (1795) represents the first collective effort to establish peaceful relationships between the newly born United States and the tribes of the lower Great Lakes. For the Myaamia, this treaty prevented the outbreak of inter-communal warfare until the Battle of Tippecanoe on November 7, 1811. Even before the Battle of Tippecanoe, this peace was never perfect and there were many individual acts of violence between the Treaty of Greenville (1795) and the start of the war. The violence of this period occurred on the hunting grounds and the spaces in between established communities. For the most part, this violence was considered murder and not war, and was in many ways expected by all signers of the Greenville Treaty. In order to prepare for future violence, the treaty provided the means of resolving these murders through the use of an agreed upon system of justice. As with most of the treaties that we signed with the U.S., follow through on this issue was inconsistent at best. Following the Battle of Tippecanoe (1811), the peoples of the lower Great Lakes were able to bring themselves back from the brink of total war by clinging to their hopes for the peace established at Greenville. In May of 1812, Myaamia leadership publically chastised Tecumseh by again referencing the treaty and stating unconditionally, “We, the Miamis, have not hurt our white brethren since the treaty of Greenville. We would be glad if all of the other nations present could say the same; we will cheerfully join our brethren for peace, but we will not join you for war against the white people.” Myaamia leadership believed that to go to war with the United States “would be our immediate ruin.” Sadly, their predications were right. The failure of the peace established at Greenville fractured our communities. In the first year of the conflict, some Myaamia villages chose war and some peace, but both choices produced the same charred ruin. By the end of the war, American forces burned most Myaamia villages three times over. Question: Did Myaamia families share friendships with American families? One of my goals throughout the process of helping Helen Frost with SALT was to try to provide enough historical background so that the narrative communicated the fracturing and traumatic experiences of the War of 1812 from the point of view of a village-centered family. Families were deeply affected by the chaotic nature of the violence of this war. During the early months of the war, families struggled to survive and maintain as much of their pre-war life as possible. Throughout the first year of the war, there are numerous stories of families seeking to protect and shelter friends who were caught on “the other side” of the war. As the war continued and communities disintegrated this became more and more difficult. While James’s American family is fictional, they are representative of the many good relationships my people sought to build following the Treaty of Greenville. At that treaty, the American state took on the symbolic role of “father.” Myaamia people understood a father to be a symbolic provider of shelter, warmth, and care. Through our experiences with the French and British we realized that Europeans had a different understanding of the role of a “father.” However, prior to the War of 1812, Euro-American behavior fell somewhere in between the caring Myaamia father and the Euro-American patriarchal father. James’s fictional family is representative of our collective efforts to build alliances with the Americans. James’s mother, Lydia Gray, comes from a family that has been living and trading in the area for three generations. Trade was originally one of the key actions that established peace and built relationships between distinct and different peoples. Over time, capitalism shifted many of the meanings associated with trade, but for Myaamia it remained a major means of alliance building. Traders were some of our greatest political and economic allies, and after the War of 1812 also became some of our fiercest enemies. Through the book, the boys struggle to understand this connection between their families and their peoples, but James and Anikwa’s internal and external conflicts are reflective of the broader circumstances in which the alliance produced by the Treaty of Greenville failed. One of the questions that the historical record cannot fully answer for us is, what happened to the more personal friendships that were created during this period between the wars? I think the book carefully avoids giving readers a clear answer to this question. For example, near the end of SALT the families share a meal. In this meal, Anikwa’s destitute and homeless family shares the little that remains of their lives with their guests, a people that they once considered friends. They do this because the habit of treating one’s guests with respect is a part of their core as Myaamia people. This practice of generosity is one of the key ways our community still builds and maintains relationships with each other and with outsiders. Despite that meaningful echo, I still feel that this final scene is full of emotionally necessary and historically accurate ambiguities and questions. As a reader, I’m left wondering, does the friendship between the families and the boys endure? In that closing scene, James and Anikwa struggle internally with their thoughts and their families turn to music to find common ground. But even here this musical communication has an ambiguous character to it. It could be hopeful or it could be mournful. The author gives readers the freedom to think about it and decide for themselves. As a tribal historian, my interpretation is prejudiced by my knowledge of what follows. I see the coming darkness as swallowing their song and as a sign of what is to follow. I can say that I hear no laughter in this moment and I feel no joy when I think of the dire circumstances faced by all Myaamia communities in the winter of 1812. But between the end of the War of 1812 and the forced removal of 1846 much that was good occurred as well, and so it is certainly historically possible to take a hopeful view of the families’ song. Question: Why does salt play such an important role in SALT? From my earliest interaction with the book, the author, Helen Frost, had already made salt a centrally import element of story. However, it was an element that made sense to me as an historian both in terms of accuracy of detail and as a metaphor for the impacts of land loss. In our lives today, we often suffer from ingesting too much salt and as a result we often forget that a minimum amount of salt has to be consumed for life. For our ancestors, some of this salt was consumed naturally as a part of foods. Some salt was harvested at salt licks and salts springs, which were located at strategic locations in our homelands. Our people knew how important wiihkapaakani (salt) was for life, and our leaders requested payments of salt as our communities signed treaties relinquishing the parts of our homelands that contained salt deposits. This agreement added to the growing dependence of community on the United States government and Euro-American traders, who provided supplies on credit in between payments. This dependence is revealed in the documents associated with payments and the lists of rations issued at the Fort Wayne agency. From 1795-1811, salt shows up in the vast majority of these lists. As the numbers of settlers increased in the Indiana Territory, salt became scarcer and all groups began to worry about access to this vital resource. Throughout 1811 and 1812 the quantity of salt being issued from Ft. Wayne fluctuates dramatically. In the summer of 1811, the residents of the village of Prophetstown seized the entire salt annuity as it was being brought up the Wabash. As a result, no salt was delivered to Ft. Wayne and Kiihkayonki. These disruptions in annuity payments only increased as war descended on the lower Great Lakes in the summer of 1812. But beyond the historical details, salt is beautiful metaphor of our people’s connections to our places. Wiihkapaakani (salt) is a substance that is essential for life, comes out of the earth, and moves through the bodies of the living entities with whom we share our places. But it is a substance that became more difficult for us to attain as treaties divided us from our places and each other. It is a substance for which we became dependent on others. As American leaders broke their promises and at times withheld annuity payments, the collective body of our community began to suffer the consequences of the fracturing of land and people. The salt poems that the author interspersed throughout the text breathe life into this metaphor of connection to place. If you want to read an example of one of the salt poems, click here and look at page 15. These poems allow readers to bring their own imaginations and feelings into the process of understanding connection to place. For me, the poems create a mournful feeling of loss that is balanced with recognition that life did endure after the War of 1812. Again, prejudiced by my historical knowledge, I see the post war years bathed in darkening shadow. For me, the final line of the final salt poem – “a gift of light and shadow” – forecasts the forced removal that comes in 1846. When one’s words are few, each choice is precious, and here the author uses these poems to beautifully evoke the complexity of life. For Myaamia readers, or those who know the historical record well, the final line parallels the words of Mihšihkinaahkwa in the last months of his life. In the winter before the war, he appealed to William Henry Harrison to resist the path of violence. “The clouds appear to be rising in a different quarter, which threatens to turn our light into darkness. To prevent this, it may require the united efforts of us all. We hope that none of us will be found to shrink from the storm that threatens to burst on our nations.” Here again, I want to honor the diversity that exists within our community and recognize that this line can and will be interpreted in variety of different directions. Michael McCafferty demonstrates that the Delaware were the first to use this name possibly in reference to the Myaamia having lived in the area the longest. The name increased in use after the construction of Ft. Wayne, because Anthony Wayne was also known as Kiihkaya (the old man) by the Delaware. McCafferty suggests that Cecaahkonki (Sandhill Crane Place) is a likely candidate for what the Myaamia called their main village prior to the 1780s. Michael McCafferty, Native American Place Names of Indiana (Urbana: University of Illinois Press, 2008), 76-81. Cameron Shriver recently emphasized this point in a presentation at the 2013 Ethnohistory conference. Helen Tanner and Miklos Pinther’s maps also reinforce this point. Helen Hornbeck Tanner and Miklos Pinther, Atlas of Great Lakes Indian History (Civilization of the American Indian series; v. 174. 1st ed. Norman: Published for the Newberry Library by the University of Oklahoma Press, 1987), 88 Map 18. Helen Hornbeck Tanner, “The Glaize in 1792: A Composite Indian Community,” Ethnohistory, 25, No. 1 (Winter 1978), 17. Tanner and Pinther, Atlas, 88 Map 18. Some Waayaahtanwa (Wea) and Peeyankihšia (Piankashaw) individuals may have fought against the U.S. at the Battle of Tippecanoe, but no Myaamia community chose to fight as a group until the fall of 1812. For the likelihood that Myaamia people did not participate as a group in the siege of Ft. Wayne see John Sugden, Tecumseh: A Life (New York: Henry Holt and Company), 314. 29-32. William Henry Harrison recorded an example from Vincennes in the summer of 1811 in which he seized an innkeeper who killed an unarmed, “Mucsoe Indian” (probably a Creek) and put the man on trial. A jury of his peers, fellow Euro-American settlers, immediately acquitted the innkeeper. Reactions from area Indians were obviously angry, Logan Esarey, ed., Governor’s Messages and Letters: Messages and Letters of William Henry Harrison, vol. 1, 1800-1811 (Indianapolis: Indiana Historical Commission, 1922), 525. Esarey, Messages and Letters, vol. 1, 581-82. Esarey, Messages and Letters, vol. 2, 52-53. The most famous examples of friendships under stress in the early days of the war come from Fort Dearborn and the fateful battle of August 15, 1812. The local trader, John Kinzie, and his family were protected during and after the battle by Black Partridge, a Potawatomi leader with whom the family shared meals with regularly. For more on this event see Ann Durkin Keating, Rising up from Indian Country: The Battle of Fort Dearborn and the Birth of Chicago (Chicago: University of Chicago of Press, 2012), 136-50. The American Heart Association recommends less than 1500 mg a day for an adult. http://www.heart.org/HEARTORG/GettingHealthy/NutritionCenter/HealthyDietGoals/Sodium-Salt-or-Sodium-Chloride_UCM_303290_Article.jsp#.T4XnCWBMHR1 (accessed Nov, 8, 2013). The absolute minimum needed for life is 500 mg. Some of this is gained through foods in which salt naturally occurs. http://chriskresser.com/shaking-up-the-salt-myth-the-human-need-for-salt (accessed Nov 6, 2013). 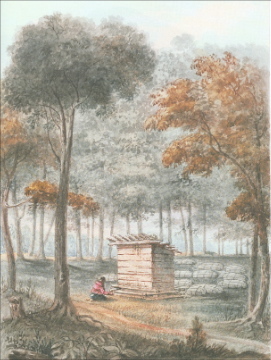 Gayle Thornbrough, ed., Letter Book of the Indian Agency at Fort Wayne, 1809-1815 (Indianapolis: Indiana Historical Society, 1961), 73-76, 77, 83, 90-92, 102, 135. On September 17, 1802 leaders cede the salt spring, which was reportedly the best source of salt between the Allegany Mountains and the Mississippi, on the Saline River to the U.S., Esarey, Messages and Letters, vol., 156. Harrison sent a salt annuity up the Wabash with instructions to issue a part of it (5 barrels) to the Prophet’s village in June of 1811, but the village seized the entire annuity. The boat returned on June 18, 1811, Esarey, Messages and Letters, vol. 1, 514-15, 518. Esarey, Messages and Letters, vol. 2, 18-19.